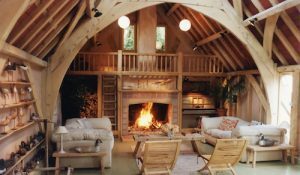 In October 2016, Carpenter Oak got the chance to revisit Lamper Head, one of our earliest and well-known builds, a short distance from our Devon yard. Before Lamper Head was realised, all that stood on the top of a windswept South Hams hillside was a dilapidated, asbestos tennis pavilion. 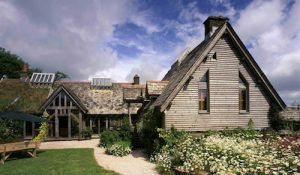 Whilst the existing structure was modest, the views from it formed a panorama that spanned the River Dart, from the vineyards at Sharpham to the north, to the village of Dittisham in the south and the fringes of Dartmoor on the horizon. 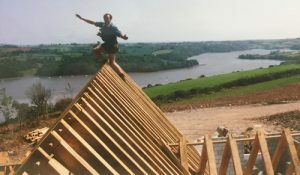 It was a view that struck project manager, Adam Milton, from his first site visit and one that deserved a structure that would be able to make the most of such spectacular scenery. 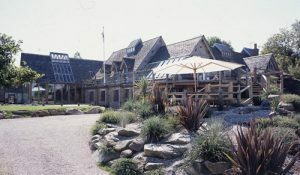 At that time, Carpenter Oak and Woodland was still based solely in Chippenham. 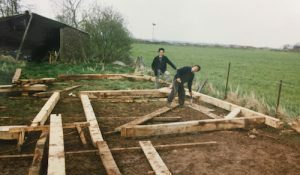 The two founding directors, Charlie Brentnall and Roderick James met working on a folly by a lake. Roderick liked converting barns but also wanted to build new structures because there was a shortage of stone barns. 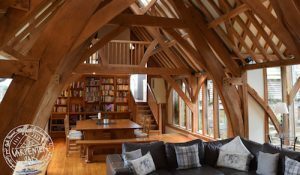 Charlie was mostly involved with repair and conservation work and in bringing those ideas and skills together with a new build direction, the company was formed in 1987. 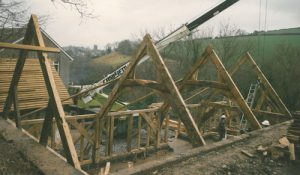 Following on from the ground-breaking Seagull House, built and owned by Roderick and just a couple of miles from the Lamper Head site, the frames acted as a springboard for the company and the second yard in Devon started in 1995. Carpenter Oak today, and tomorrow. 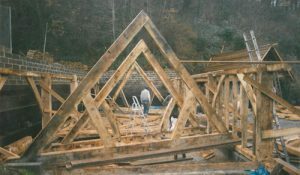 . .
Carpenter Oak Ltd. set up independently from Carpenter Oak and Woodland in 2001. Between them, hundreds of frames have been built all over the country, as well as overseas. In 2015, the companies re-united, marking the next chapter in each company’s development and harnessing combined strengths, expertise and craftsmanship. 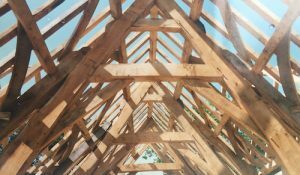 Adam has seen the oak framing industry expand and evolve, as well as techniques and people’s tastes.